I spent a month living in a young girl’s bedroom while serving as an artist-in-residence in a high school in Western Kentucky. 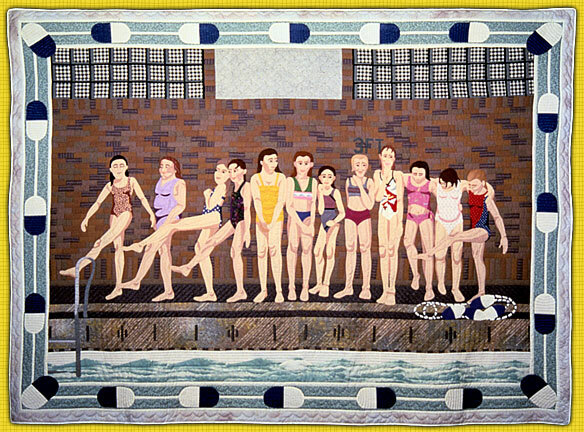 The photograph on which this quilt is based was hanging on her bulletin board. I became intrigued during that long month by the photograph and what you could tell about each girl by the way she stood or posed for the picture. I also liked the idea of portraying these girls at the time in their lives when they were just starting to bud into womanhood. 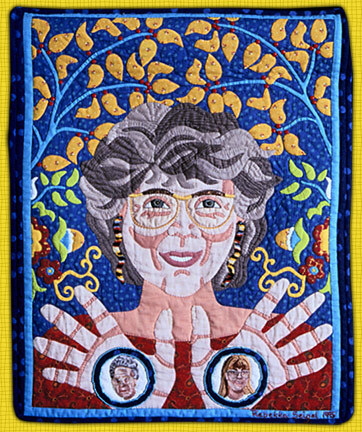 This quilt gave me the opportunity to continue to develop my use of appliqué to depict the human face and ﬁgure. 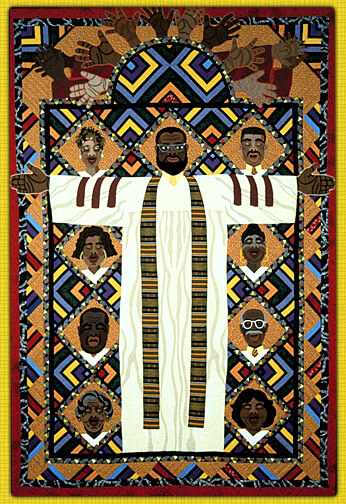 The imagery in this quilt freezes the moment of “budding” for all time and reminds us once and again how beautiful we are and how time changes us. The image of the cowgirl is for me a wonderful symbol for women. She represents the spirit of joy, freedom and equality with a real ﬂair for dressing ﬂamboyantly thrown in. 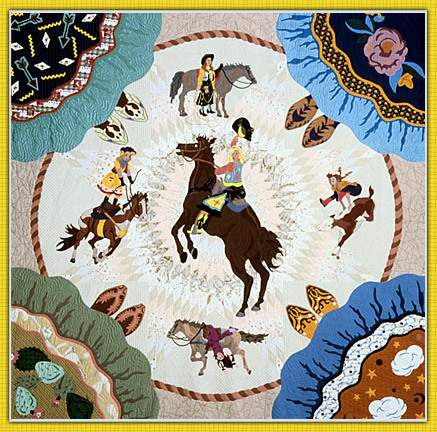 The traditional quilt pattern of the “Lone Star”, associated with the movement West of our culture and pioneering spirit, forms the body of this quilt. Small portraits of cowgirls at work in the barnyard, rodeo and Wild West shows are appliquéd to the background. 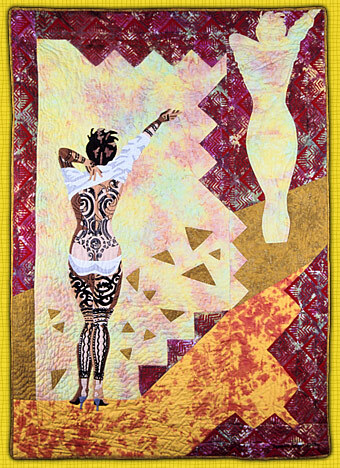 This quilt was created because I love the human face and enjoy exploring its many variations in my work. It seems to me that of all the ways human beings get together to form groups, that of singing is the most joyous and of all the types of singing groups, the black gospel choir conveys the utmost joy. I tried to convey that sense of joy in this piece from the serene look on the leader’s face to the eyes closed in ecstasy of the singers to the clapping hands at the top of the quilt. The colored strips of fabric represent the stained glass windows of the church in which I might actually ﬁnd this group or one like them. The pose of the central ﬁgure resembles that of Christ on the cross, a subject that I am sure this choir would sing about often, or the layout architecturally of the great cathedrals which also corresponds to the stained glass window effect in the body of the quilt. This piece is all about joy and was also inspired by the music and imagery of Lyle Lovett, one of my favorite musicians. 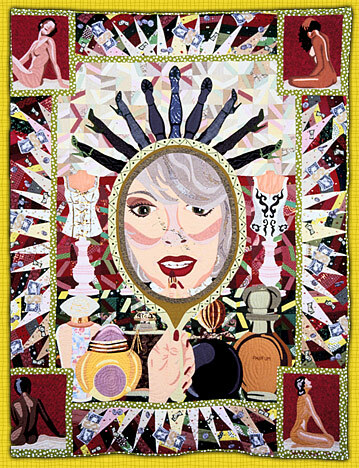 It seemed time for me to create a self portrait after putting so many other faces in my quilt art for so many years. I spent a month in Northern Ireland teaching quilt making in 1995.
of my passion. I am surrounded by folk art inspired motifs because I feel that my approach to the art of quilt making grows out of a folk art tradition passed down to me by my grandmother. 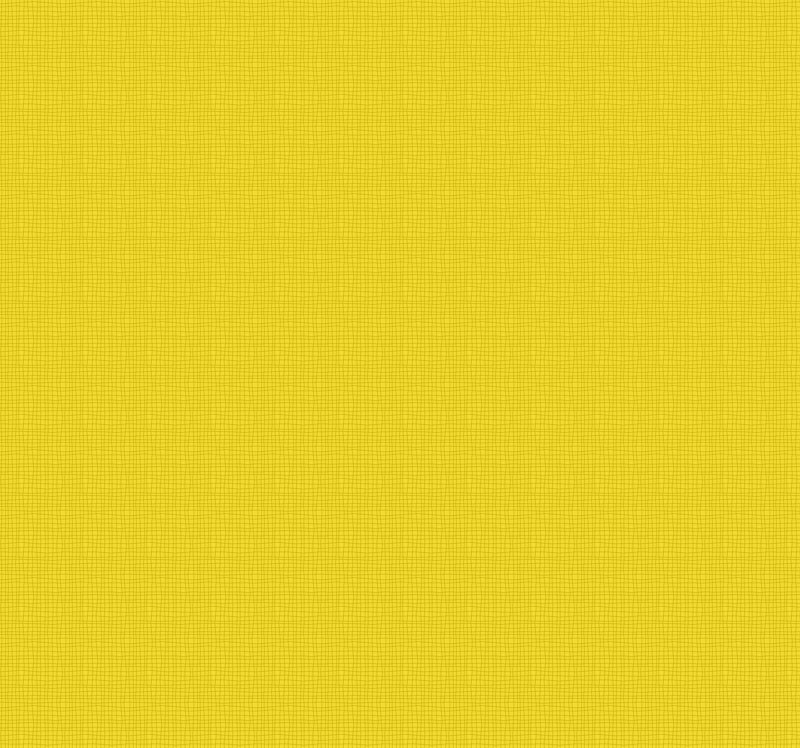 for beauty to be achieved. Created in response to an exhibit at the Kentucky Museum of Art and Design entitled “The Body Adorned”, Lydia the Tattooed Lady is giving us an excellent view of her tattoos from the back. I embroidered all of the tattoos and included one which says MOM because a friend told me she gave her son permission to get as many tattoos as he wanted as long as they all said MOM. whenever I came across them.